Wait, you mean this is actually happening? It seems like we’ve be pining for Adrian Gonzalez to come play first base and anchor the lineup for the Red Sox since, oh, the day after Mo Vaughn signed with the Angels. The feeling must be similar for Red Sox general manager Theo Epstein, who has coveted Gonzalez at least since the former No. 1 overall pick in the 2000 draft was buried behind Mark Teixeira and Hank Blalock with the Texas Rangers. Imagine the heist had they been able to acquire him for Casey Fossum all those years ago. Now he’s finally on the verge of getting his man, though make no mistake; the soon-to-be consummated deal, while one that is absolutely necessary and should have Sox fans giddy, is no heist. The Red Sox, as I’m sure you read to some combination of shock, delight, and perhaps some slight reluctance when you woke up this morning, will send three tremendous prospects to Jed Hoyer and the Padres: first baseman Anthony Rizzo, pitcher Casey Kelly, and outfielder Reymond Fuentes, with the possibility of a player to be named later according to one report. That is a haul for the Padres, receiving three of the Sox’ top six prospects in a deep farm system. Kelly, who struggled in Double A at age 20 in his first full year of pitching, remains widely regarded and rated as the Sox’ No. 1 prospect according to Baseball America. If you happened to see Rizzo, a smooth-fielding power-hitting first baseman, in Portland late last summer, you couldn’t help but be enamored with him; we’re not saying he’ll be Mark Teixeira, but it’s impossible not to be reminded of him when you watch his swing. And Fuentes, the top pick two years ago, is a talented lottery ticket with an NL player’s skill set. It’s a lot, it’s fair, and this is the way it had to be. As I wrote in a fairly prescient column (well, for me) a little more than a year ago urging the Red Sox to pay the price for Gonzalez, they were not going to get him for a bargain, not for some fantasy baseball con job of the rube of your league (or Omar Minaya). Hoyer and assistant general manager Jason McLeod are perhaps the two people most responsible for the current riches in the Sox system. McLeod was the director of amateur scouting before joining Hoyer, Epstein’s chief confidante during his time with the Sox, in San Diego last October. Kelly and Fuentes were both chosen in the first round on McLeod’s watch. These guys know the farm system they left behind intimately. You can be sure they are confident today that they are getting the right players in return for their franchise cornerstone. Of course, the irony is that they did such a spectacular job identifying amateur talent while they were here that the Red Sox had the redundancy in the farm system to make today’s deal. 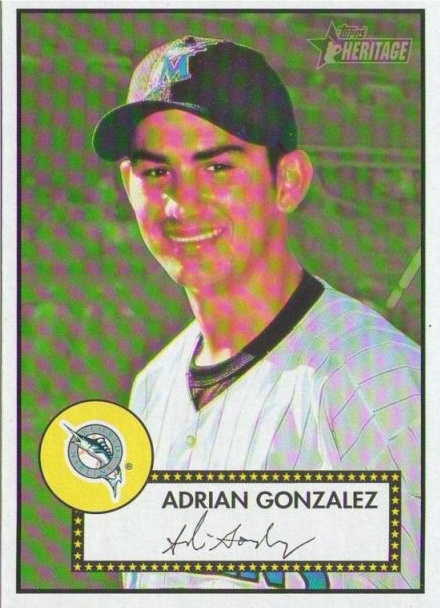 Whatever the price may be, this much we are sure of right now: Gonzalez is exactly what they need in their lineup. He’s entering his age 29 season, plays a spectacular first base, has put up beastly numbers at hitter-tormenting Petco, and otherworldly numbers elsewhere. (The past two seasons he has 48 home runs on the road.) His lefthanded swing is tailor-made for Fenway, whether they move in the right field fences or not. He will put some bruises on the Monster, and you’re going to love him. The strong hunch here is that any fans who were not wholeheartedly enamored with acquiring Gonzalez lacked familiarity with him. So let’s put it this way: My old buddy Mazz won’t be lamenting letting Teixeira get away on his radio show every other day. The Red Sox finally have his equal, and perhaps his superior. So about that notion that the Sox were getting cheap, that they would be reluctant to do something big . . . well, I guess Tom Werner knew of what he spoke when he said they’d make a splash. This is a splash, a terrific trade in all regards. It’s one of those hot-stove joys that carry a baseball fan through the winter, those obligatory visions of sugar plums replaced by imaginary lineup cards. Ellsbury, CF; Pedroia, 2B; Gonzalez, 1B; Youkilis 3B . . . Hey, how about Jason Werth now? The pieces are falling into place. 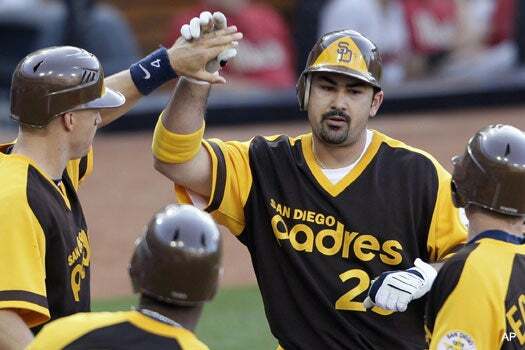 Adrian Gonzalez is about to come to Boston, finally and at last. Sure do wish Opening Day could be tomorrow.